Scaffolding in use on the Step Pyramid. 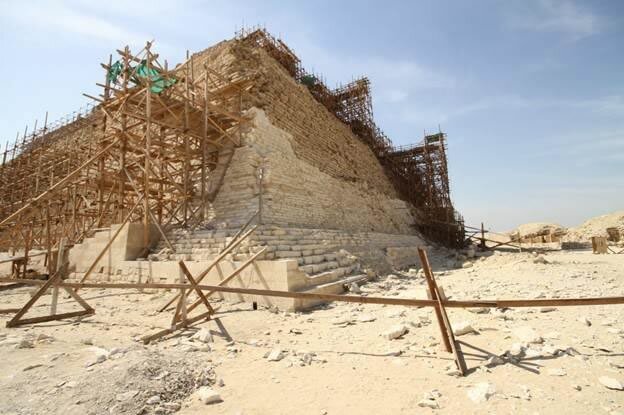 In recent restoration work on the pyramids, traditional timber lashed together has been used as scaffolding, which demonstrates how it is more than possible to use scaffolding to construct the pyramids. A Newport, Wales-based engineer has presented a new theory on how Egypt’s great pyramids were built, challenging many of the ideas accepted and shared across the world currently. Peter James, managing director of Newport-based engineering company, Cintec International, suggests that the ancient Egyptian builders used construction techniques that still are commonly used by modern-day builders. 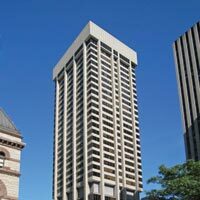 The practice of using high-quality stone on the outside of a building and lower-quality infill on the inside, is an age-old builder’s technique still employed for modern structures, and one which James believes was used by the Ancient Egyptians when constructing the Pyramids. The sheer size and ingenuity of the pyramids has amazed humankind for centuries. 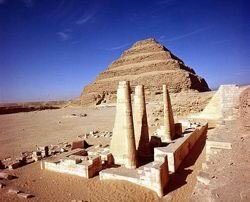 The Step Pyramid, which is 62 meters high, was the first high-rise structure the ancient Egyptians built, as normally their structures were no more than 10 meters. Although archaeologists have long been fascinated with, and have widely researched how the ancient Egyptians built these incredible monuments, there still is a lot of mystery surrounding the process. Cintec have worked in Egypt restoring its historical buildings for 18 years and have undertaken restoration work on Mosques, Temples, and both Egypt’s Red and Step Pyramids. During this work, James has witnessed what he describes as, “the evolution of the ancient Egyptian builders knowledge and techniques.” He says that, “with every pyramid they built they became more skilled and put right previous design defects.” Therefore, they built the pyramids in the most efficient and innovative way they knew how. James’ new theory was initially sparked by observations he made during work restoring the ceiling of the burial chamber of Egypt’s Step Pyramid. 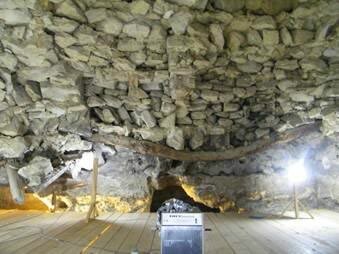 Cintec was called in to restore the ceiling, which was collapsing due to the failure of the timber beam which the ancient Egyptians used to hold the ceiling stones in place, buckling under the weight of the stones. 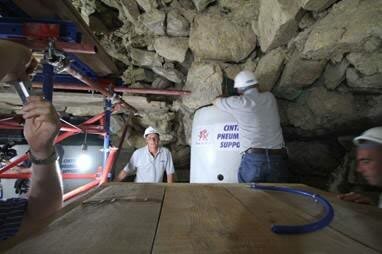 Cintec’s unique Waterwall airbags were used to temporarily support the dangerous hanging stones, and Cintec’s patented anchors were inserted to permanently secure the chamber ceiling. The burial chamber of the Step Pyramid. While in the burial chamber, James noticed that although Cintec were drilling holes that were 4 meters in length, they never actually drilled through stones that were more than 40cm wide. This appeared to directly contradict the common belief that the large stones on the outside were the same all the way through the pyramid. This observation led him to question the historical theories on this and other aspects of the construction of the pyramids. James believes that the pyramids consist of three different ‘layers.’ First, the middle core that is visible on every pyramid after the Bent pyramid. James predicts that this layer is only three blocks wide, with the blocks diminishing in size as they near the apex. He suggests that this layer was used by the Egyptian builders to retain the core filling and would have been a key to connect the outer cladding. 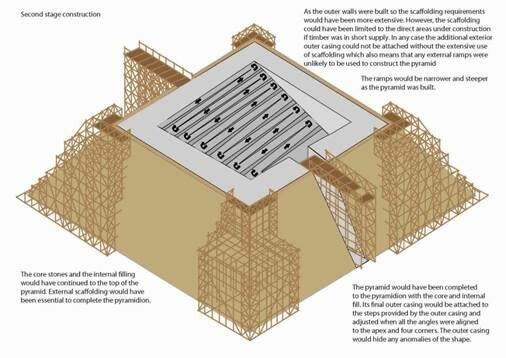 The step design of the pyramid meant that the builders were able to connect the cladding to the pyramid while still supporting the weight of the cladding blocks. James suggests that the infill and central core of the pyramid primarily consisted of much smaller stones, and any other larger blocks the builders wanted to conceal. He believes that the inner core was used to create internal ramps, which enabled the Egyptians to build the pyramid from the inside out. The ramps were started at the mid-point of the pyramid and would zigzag across the full internal width of the pyramid, matching the height of the middle-core stones as the pyramid was built. The small number of heavy middle core blocks could easily be raised on these internal ramps and positioned at the perimeter of the pyramid. As most of the inner fill stones were much smaller, they could be easily handled by men and animals. The ramps would get steeper as the pyramid grows in height, but this would not exceed the normal angle used to calculate the external ramps gradient. The ramps could have had small palm tree trunks partly embedded into them as a mechanism to slide the heavier core blocks on wooden sledges. As the pyramid reached the apex, more reliance would have to be made on the scaffolding to top out the pyramidion. Diagram demonstrating the three ‘layers’ of the pyramids. The final layer is the outer cladding, which would have been added last and used by the ancient Egyptians to smooth the outer appearance of the pyramid and ensure its ‘true’ pyramid shape using additional stones or tufla grout, like the final icing on a cake. In recent restoration work on the pyramids, traditional timber lashed together has been used as scaffolding, which demonstrates how it is more than possible to use scaffolding to construct the pyramids. James points to a previous discovery to support his theory that the core of the pyramid consists of these smaller ‘infill’ stones. In the 18th century, archaeologists or treasure hunters used gunpowder to break into Khufu’s Great Pyramid of Giza in search of treasure. The explosion left a gash at the side of the pyramid, exposing a jumble of large blocks that were neither coarse nor aligned. 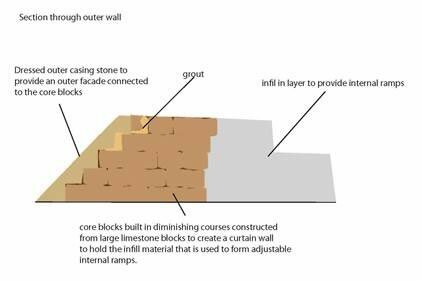 This supports James’ opinion that the internal fill of the pyramid is a mixture of material, and not the block work that we can see from the outside. Stylized pyramid of the second stage of construction. Furthermore, it has already been established that the smaller pyramids, which surround some of the large pyramids, were built with this structure of good quality, large stones on the outside, and a central core filling of smaller irregularly shaped stones. The question therefore arises again; why would the ancient Egyptian builders make the work much more difficult for themselves and not use this same technique for the larger pyramids? James admits that these are only his theories and not proven fact. However, he suggests that there is an easy way to put his theory on the core filling of the pyramid to the test. He volunteers to use a diamond drill to drill 100mm holes into the pyramid at varying heights, to a depth of 30 meters to investigate the interior of the pyramid. He offers to do this at no charge to the Egyptian Antiquities, and would use the latest dry drilling techniques to ensure no damage to the pyramid. This is not the first time thanJames has employed his engineer’s mind to answer some of the riddles of the pyramids. Earlier this year, he proposed his explanation as to why the Egyptians stopped building the pyramids and instead moved to bury their pharaohs in the Valley of the Kings. He explained that thermal movement caused damage to cladding of the pyramid. The stones and debris that fell to the ground were then taken away and used for other buildings. He believes that such damage may have contributed to the decision to stop building pyramids. James’ theory on thermal movement is now accepted by the archaeological community across the world, including experts at the Cairo University. For more information, as well as a link to a National Geographic video on the subject, visit: http://www.cintec.com/worldwide/current-projects-updates.php. CINTEC Worldwide, a leader in the field of structural masonry retrofit strengthening, repair, and preservation, has been featured in a documentary created by National Geographic for the company’s restoration of the Pyramid of Djoser. CINTEC America, a leader in the field of structural masonry retrofit strengthening, repair, and preservation, announces that after extensive site testing and evaluation it will supply a new anchoring system for the overhead glass fiber reinforced concrete (GFRC) panels for the NYC MTA subway station retrofit project for station platforms at 168th station and 181st station.